At a time when a lot of attention is being given to digital engagement in healthcare, Andy Yeoman points out that traditional ways of interacting should not be forgotten and – in the case of training and education – can result in better uptake and retention of information. I’m guessing that most of you work in teams, live in families and relax with friends. You probably don’t live in isolation, communicating only online. Are your customers that different? Visit any hospital or care home and it will be full of people talking and collaborating face to face. Healthcare delivery is driven by direct human interactions. Technology supports these relationships, but it doesn’t replace them. Our days are filled with real conversations and real people and the most meaningful things usually happen in person. So, digital isn’t always king. Pharma has always funded education and training for healthcare professionals (HCPs). Effective training is vital to improve safety and outcomes and it has never been more necessary, because internal training suffers when money is short. This represents a huge opportunity for the industry. But are eLearning and apps the way forward? Maybe not. The views of frontline staff questioned by the researchers about what they wanted are outlined in Figure 1, taken from the report. Some respondents were explicit in their views about digital: ‘… online training is one of the worst ways to actually learn anything. It has become a tick-box exercise.’ So, lots of your customers prefer face-to-face engagement over digital. These doctors, nurses, commissioners and managers are intelligent people, so we shouldn’t ignore their preferences. If your customers want face-to-face engagement, why disappoint them? But what does a practical, team-based intervention look like? It can look like this: a roomful of stroke specialists enjoying themselves as they refresh their knowledge of the clinical pathway. They’re playing a board game, The Stroke Game, and it is the catalyst for their discussions; there is no facilitator and it’s entirely analogue. 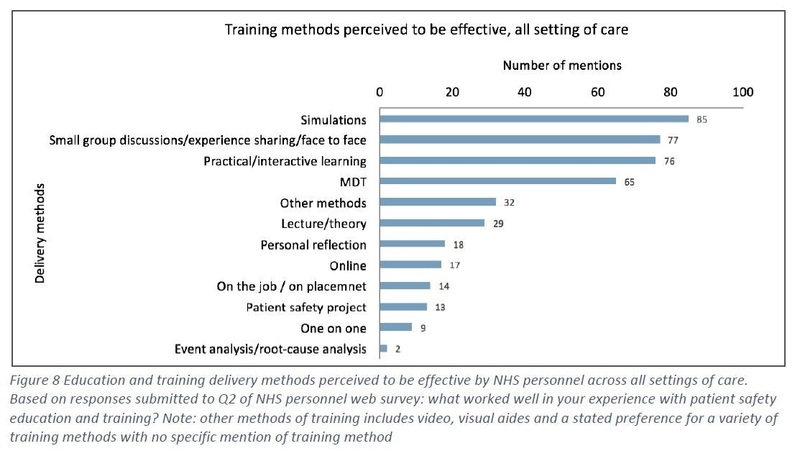 This is an example of the team-based interventions mentioned in the Imperial College report. 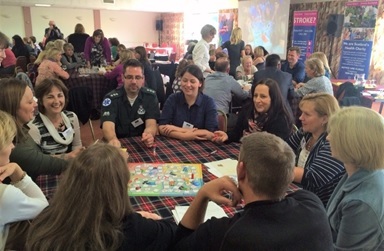 The game was developed in partnership with Chest Heart & Stroke Scotland and stroke specialists at NHS Lanarkshire. The UK pharma industry organisation the ABPI supports the game and has donated one to every stroke unit in Scotland. 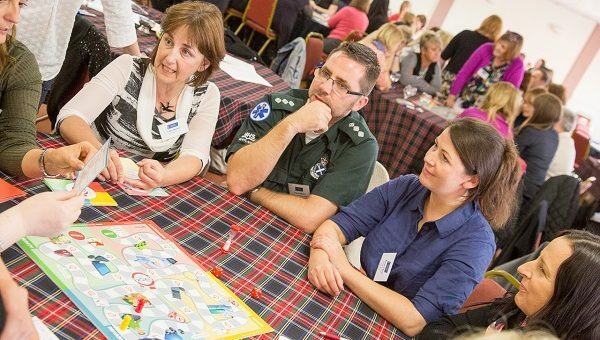 This is one of dozens of different board games being used in hospitals, care homes, and universities across the world. Several independent evaluations of board games have been carried out recently and they conclude that board games are effective. 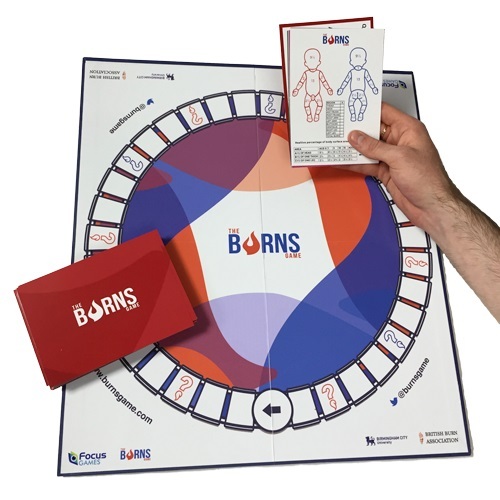 The most recent examination evaluated The Burns Game, which is aimed at clinical staff who deal with burn injuries and was developed with specialists from British Burn Association and City University Birmingham. The full evaluation was published in Scars, Burns & Healing journal, which you can read here. Several forward-thinking pharma companies are now sponsoring board games. 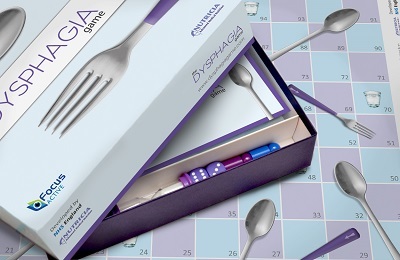 The Dysphagia Game is a good example of how a board game can support the industry’s commercial strategies. Dysphagia is a condition that makes swallowing food and drinks difficult. It is particularly associated with dementia, Parkinson’s disease, or cancer, and can affect people who have had a stroke or surgery around the head or neck. It increases the risk of malnutrition, dehydration, aspiration pneumonia and choking. Dysphagia also affects quality of life as a result of malnutrition, dehydration, anxiety and embarrassment. The most common management strategy is to change the consistency and texture of food and drinks to make it easier for people to swallow. A range of prescription products is available to thicken food and fluid for a ‘texture-modified diet’. Dysphagia is not well understood by healthcare workers and this puts people with the condition at serious risk. There is a need for practical, frontline education to help improve its detection and management. However, engaging staff with structured education can be difficult, especially in busy care homes and hospitals. 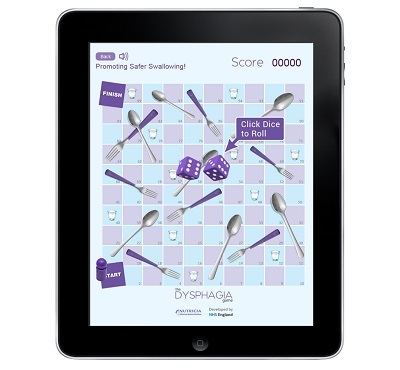 Seeking to address this need, Caroline Lecko, Patient Safety Lead at NHS England, approached us to develop a bespoke, game-based training tool to help improve management of dysphagia among frontline staff (mainly nurses, allied health professionals and care assistants) and carers. Nutricia Advanced Medical Nutrition sponsored and supported the development, manufacture and distribution of what became The Dysphagia Game. It was agreed that this would be a physical board game, built around evidence-based educational content. Players would be HCPs in hospital and community settings, care homes, hospices, and universities. The game would be self-supporting and not require a specialist facilitator. Games should accommodate up to 12 players and take between 30 and 60 minutes to play. An online game app would be developed in HTML5 to extend the reach and impact of the programme. A steering group of experts and practitioners was convened from the following organisations to create the educational content of the game: NHS England; Royal College of Speech & Language Therapists; National Nurses Nutrition Group; Nutricia Advanced Medical Nutrition; British Dietetic Association; National Association of Care Catering, and charitable malnutrition awareness association BAPEN. So far over 3,000 of the board games are being used in the UK and overseas. It is officially endorsed by NHS England, The Royal College of Speech and Language Therapists and the British Dietetic Association. Tim Jones, senior brand manager at Nutricia Advanced Medical Nutrition stated: “We are committed to raising awareness of dysphagia to improve safety and outcomes and therefore education is core to our go-to market strategy. We are convinced that creating change in frontline staff is best delivered face to face in small groups, but engaging busy and distracted health and social care staff can be difficult. The game has received such positive support that it has been localised and translated for launch in the US, Germany, Spain, Turkey and Italy. It was evaluated against written materials conveying the same information in research conducted by Ksenia Bykova and Ulrike Frank at the University of Potsdam, Germany, who found that the game players learned more effectively. The research can be read here (scroll down the page for the English version). So, healthcare is still largely a face-to-face business and the industry should take account of the fact that its customers and stakeholders value and enjoy such interactions when planning its education and training strategies. 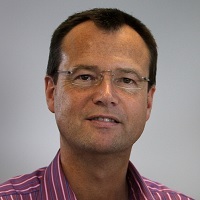 Andy Yeoman is director & co-founder of Focus Games.